Watch a brand new episode of 'Marvel's Agents of S.H.I.E.L.D.' this Friday on ABC! 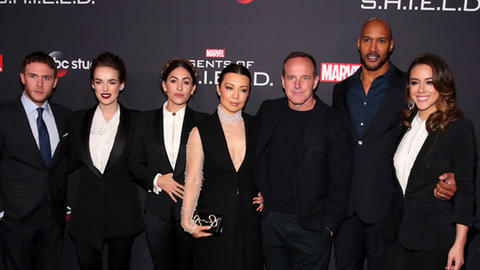 Last week, “Marvel’s Agents of S.H.I.E.L.D.” hit a rare milestone, reaching 100 episodes. Marvel’s first live-action TV series premiered five years ago on ABC, and we’ve been lucky to witness our agents tackle bad boyfriends, killer robots, Hydra, Inhumans, other worldly beings, super powered villains, the future and more! It’s the first Marvel Television series to hit that landmark, and we couldn’t have done it without all of you True Believers! For the past month, as we neared the milestone 100th, we decided to look back and celebrate 100 episode and 5 years with the cast, showrunners and creative teams. We also surprised fans of “Marvel’s Agents of S.H.I.E.L.D.” after they shared their favorite S.H.I.E.L.D. moment with us! As an extra bonus, here’s 100 episodes of “Marvel’s Agents of S.H.I.E.L.D.” in 100 seconds! Season Five continues with a brand new episode of “Marvel’s Agents of S.H.I.E.L.D.” airing this Friday at 9|8c on ABC! For more information on “Marvel’s Agents of S.H.I.E.L.D.,” visit ABC.com, follow @AgentsofSHIELD on Twitter, and like “Marvel’s Agents Of S.H.I.E.L.D.” on Facebook for all the latest news and updates! And everything else we learned from the 'Marvel's Agents of S.H.I.E.L.D.' teaser trailer!